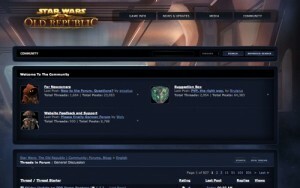 Although a playable version of SWTOR is still a long ways off, that hasn’t stopped the official SWTOR forums from growing rapidly. There are over 750 thousand posts already and as a lurker over the past two months it’s apparent that the growth is speeding up. You’ll need to register to be able to access the forums, but if you’re wanting to get a vibe for the SWTOR community, now’s the time to jump in. Like any high traffic forum it has its share of trolls, inane topics and conflicts, but the unsurprising common thread is a neverending thirst for new information of SWTOR‘s development.